For less than a weekly cup of coffee at Starbucks, you can prevent heartworms in your pet. Heartworm disease is a serious and potentially fatal condition caused by parasitic worms living in the arteries of the lungs and occasionally in the right side of the heart of dogs, cats, and other species of mammals. Heartworms are a type of roundworm, and dogs and cats of any age or breed are susceptible to infection. How do animals get Heartworm Disease? Only by the bite of an infected mosquito. There’s no other way animals get heartworms. And there’s no way to tell if a mosquito is infected. That’s why prevention is so important. Heartworm disease has been reported in all 50 states. And the bite of just one mosquito infected with the heartworm larvae will give your pet heartworm disease. 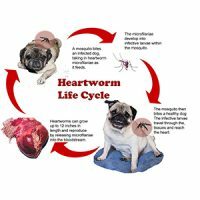 Heartworms can only be spread by the bite of an infected mosquito. Heartworm Disease is not spread from pet to pet or pet to human. It’s a specific parasite that only affects dogs and cats and ferrets and other mammals. There are several forms of prevention available to prevent this disease including: monthly pills, monthly topicals, and a six-month injectable product. The damage that’s done to the pet and the cost of the treatment is a lot more than the cost to prevent heartworm disease. A year’s supply of heartworm preventative will cost about $35 to $80, depending on an animal’s weight. The drug used to treat heartworm disease is called Immiticide. It is an injectable, arsenic-based product. The animal is given two or three injections that will kill the adult heartworms in the blood vessels of the heart. The American Heartworm Society recommends year-round heartworm prevention. One reason is that there is already a serious problem with people forgetting to give their pets the heartworm preventatives. It is a universal problem. Now if you use it year-round, and you miss a month, your pet will probably still be protected. But if you miss more than one or two months your pet could become infected. The other reason to continue treatment year-round is that many of the preventatives today also include an intestinal parasite control for roundworms, whipworms, or tapeworms. This is an easy way to protect your pet against all of these issues. When it comes to Heartworm Disease, we often speak of dogs. Cats are also susceptible; however, cats are much less likely than dogs to have adult heartworms. April is Heartworm Awareness Month, so Braxton’s is reminding its friends that heartworm disease is preventable. Visit your veterinarian to be sure that your pet is fully protected. 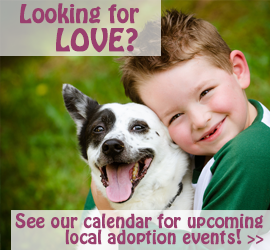 Pet Wellness Fair: April 29, 2018 from 1-4 at Braxton’s Animal Works.